It's easy to tell which employees love their job. They're often the first ones through the door because they can hardly wait to get started. They are full of energy when they talk about their work, chatting excitedly about their organization's culture, their manager and especially the interesting, challenging projects they're a part of. They wholeheartedly believe that they get to use their strengths -- their unique combination of talents, skills and knowledge -- every day. Their work inspires them, and they inspire others. This kind of work experience is obviously positive for employees, their team members and the organization they work for. But the positive effects of having such a motivating job aren't confined to the workplace. They spill into other aspects of an employee's life -- especially their well-being. In "Doing what I do best": The association between skill utilization and employee health with healthy behavior as a mediator, authors Kaori Fujishiro and Catherine A. Heaney, with the Centers for Disease Control and Prevention's National Institute for Occupational Health and Safety, present data gathered through Gallup Daily tracking to show that employees who feel they have the opportunity to frequently use their natural skills and abilities are not only more productive, but also happier and even healthier. For the study, Fujishiro and Heaney defined and measured skill utilization in terms of a survey item that Gallup has long used as part of our measure of employee engagement: "At work, I have the opportunity to do what I do best every day." They found that the higher the level of agreement with this item, the less likely employees were to report having poor or fair health, hypertension or high cholesterol. These reports were mediated by healthy behaviors including diet and exercise. Employees having the ability to do their best at work creates compelling benefits for employers too. 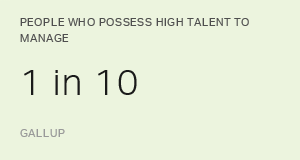 Gallup has consistently found that when companies and managers focus on giving people an opportunity to use their strengths, they can better attract, retain and engage employees. For example, our research reveals that 60% of employees say the ability to do what they do best in a role is "very important" to them when considering whether to take a job with a different organization. In fact, it is the top factor in a job search. Conversely, we've found that poor job fit is one of the top five reasons employees give when leaving their current job. Employees are drawn to work that "fits" them. They want the hours they spend at their job to feel meaningful and worthwhile. When they can do what they do best, they give more of themselves to their job and organization. In terms of engagement, Gallup's State of the American Workplace report finds that just four in 10 employees strongly agree they have the opportunity to do what they do best every day. By moving that ratio to eight in 10 employees, organizations could realize an 8% increase in customer engagement scores, a 14% increase in profitability and a 46% reduction in safety incidents. With all of this in mind, how can organizations take action to empower employees to do what they do best every day and, therefore, increase their likelihood of having productive, happy and healthy employees? It starts with managers, who should constantly be on the lookout to spot each employee's unique strengths. Employees who know and use their strengths are six times as likely as other employees to be engaged and to say they do what they do best every day. They are also three times as likely to say they have an excellent quality of life. Keep in mind that strengths often go beyond the tasks and expectations of specific roles. Managers should watch for clues to how an employee thinks, gets work done, influences others and builds relationships. Focused attention in these areas helps managers uncover and develop their employees' natural talents. By empowering employees to use their talents more frequently, managers foster an environment where thriving employees contribute powerfully to a thriving organization. Remember those enthusiastic, energized employees we mentioned earlier? The healthy, confident, proactive and productive employees who talk about and show how much they love their work? The "Doing what I do best" study assures us that they have the potential to become the norm, not the exception. The key to their success may simply be for their organization to help them do more of what they do best every day. Gallup can help you create a culture of strengths, engagement and well-being that means better lives for your employees and improved outcomes for your business. Help your employees discover what they do best using our revolutionary CliftonStrengths assessment. Download our State of the American Workplace report to learn more about what matters most to employees in a job and organization. Inquire about our comprehensive well-being services and solutions including surveys, audits, training and keynotes. Scott Miller is the Content Leader for Gallup.